The files on this page, Home School Lesson Planners with One Column, are part of Donna Young's Homeschool Lesson Planner Set, "by Columns." This set consists of mix and match files in both PDF and DOC. This set does not include any administrative layouts, but because the styling if by Columns is basic, they should blend in well enough with some of my other homeschool planner forms. Like the other by Columns lesson planners, the one-column layout includes various quantities of boxes with check-off squares. Some of the layouts feature a ruled area and some do not. 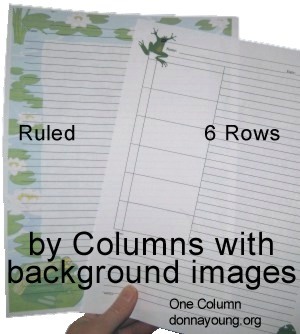 Among the files on this page, you will find one Row Planner [ What are Rows Planners? ]. A few years ago a homeschool mother wrote to me about a planner; she asked, "I want one sheet for each day, with a column for subjects, a column for pages or lessons to be done and a column for notes." She found what she needed among the column planners. This layout includes 5 rows, each row containing one large box next to a ruled area with 6 lines. This layout features 6 rows, each row containing one box next to a ruled area with 4 lines. The lower part is another lined area. This layout includes 9 rows, each row containing a box next to a ruled area with 4 lines. This layout includes 9 rows, each row containing a small box next to a ruled area with 3 lines. The lower part is another lined area. This style is a Row Planner. Each row includes one wide box. This file will produce matching lined paper. You'll see this file repeated on the other ruled paper pages in by Columns. Note: Clicking on the doc links might load your word processor inside of your browser, making editing more difficult. Read how to get around that on the By Columns home page, 4th paragraph. Illustration 1 demonstrates the ability to personalize the DOC files. I have supplied instructions for placing images on the doc planners. I have included two sample files from Illustration 1. If this interests you, keep reading. The first thing to realize is that the column planners are mix and match. By choosing the layouts from the various pages at by Columns based on what you need, you can put together a home school planner that might work well for you. I'm sure you know that the DOC files may be edited and that requires that you have some knowledge about your word processor. Word processors usually include help files, so refer to those when you need help. Below are a few changes to the files that you might need or want to apply; however, before adding columns, be sure to look at my other by Columns files. If there are not enough blocks, you can add more. If there are too many blocks, you can remove them. You can change the color of the grid lines. You can add background images. There is an example of background images below. The images that I used are from Microsoft's Online Clip Art, which I accessed from Word. I used the search word, frog. The images are placed in the header part of Header/Footer and then the images are "Formatted." Re-sized: The images that you deside to use may be re-sized. The image in the sample ruled file was increased by just less than 300%. The Layout was changed to Behind Text. The image in the Sample Ruled file was faded a bit. Fading an image is done at the Picture tab. I used the settings 70% Brightness and 30% Contrast. Getting this setting just right requires test printing the file and then making any necesary changes to the brightness and contrast. A more detailed article about this topic of inserting background images into a word document (2002) is in the household section at donnayoung.org at: Sans-List Block Calendar, Adding a Background Picture.